Porch covers and porch canopies incorporating Sunbrella awning fabric sized to fit most porch widths, French doors and extra pane patio doors.The porch canopies, covers and awnings make sheltering that porch area a whole lot easier as most window awnings do not provide for enough projection to extend out to the depth that decks, patios and porches have been made to. 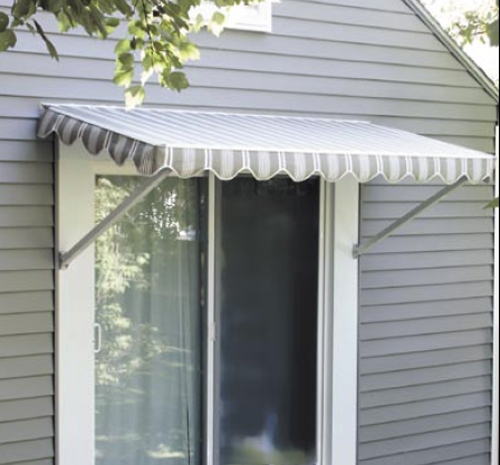 These particular styles of porch covers are available in widths from four feet out to eight and one-half feet with other Sunbrella fabric porch canopies extending to widths as great as twenty feet. The porch canopies are also available in a variety of projections from eighteen inches all the way out to four feet. The porch covers are also made to last a lot more than a single season with specialized fabric Tenera fabric thread made by Gore-Tex that is used on all the fabric seams. This thread is designed to last a lifetime. These Sunbrella porch covers, canopies and porch awnings are a perfect match if you are looking for a little added shade for your favorite pet or would like to make better use of the attached deck, porch or patio area even on those particularly sunny days. Please note that these porch covers require a minimum of three inches of mounting space above the door.